What do you get when a student from a top-ranking university decides he wants to do something cool? MIT student Quang Truong created the Evaptainer, a mobile, cooler-style device that operates on sunshine and water. An extensive globetrotter, Truong has seen the consequences of food spoilage in developing nations firsthand. Due to the high costs and unpredictability of electric refrigeration, small farms reportedly lose out on profits each year, because they can’t keep their goods cool. In parts of Africa, 40 percent of produce spoils before it reaches the consumer, according to the Food and Agriculture Organization. 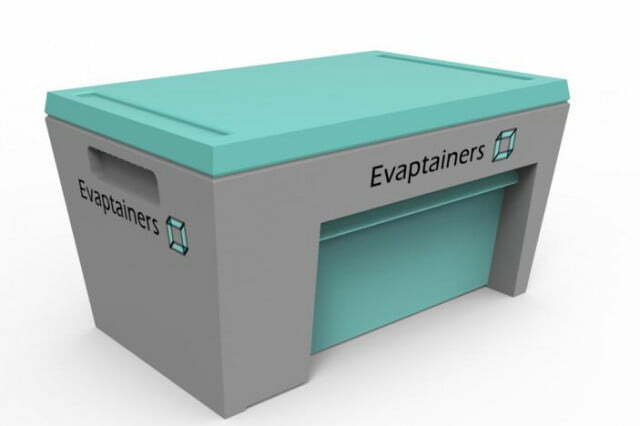 The Evaptainer can help to combat this problem, because it operates using an evaporative cooling process, hence its name. Traditional devices, called zeer pots, are made of terra cotta; a layer of wet sand keeps the internal pot cool as the water evaporates and draws heat away from it. Lighter and less breakable, the Evaptainer also extracts heat out of the unit’s interior but instead uses highly conducive aluminum plates and special fabric. Related: Putting the “pee” in power: This toilet generates electricity. Ideal for off-grid, rural areas, the alternative refrigeration system requires six liters of water to work and keeps food cold and fresh for 12 hours. It’s reportedly able to hold 60 liters of produce, which amounts to a lot of tomatoes — about 150 of them. Adding to its accessibility, Truong designed the device to work without fans, pumps, or anything breakable. Together with his business partner, Quang has invested $20,000 in to the Evaptainer’s commercial development, which is currently underway. The devices should cost $10 to $20. A pilot program is taking place in Morocco with two units. “Previous studies on evaporative cooling technologies and zeer pots show an average income increase of 25 percent. We estimate a payback period of two months per unit, based on increased income from reduced spoilage,” Truong told CNN.